When I hopped out of bed this morning and my feet landed on smooth, beautiful hardwood floors, I felt like I was at someone else’s house. Having just returned from a week in Bar Harbor, the floors are still very new and exciting to us. The endless hours of work have already been forgotten, and we’ve taken to gazing lovingly at the wood like proud parents. The refinishing? Without a doubt worth every minute, every dime, and the long 1.5 years we had to wait to tackle it. Even if it meant a summer of cat-pee seepage. The pine beadboard in the dining room didn’t come out exactly as planned; it took the stain in a patchy fashion, and sucked up every drop. In hindsight, we should have seen this coming – pine just doesn’t stain as nicely as oak, especially 100-year-old pine that’s been painted 5 times, stripped, and then sanded. But the dark color is growing on us and it does look better than the paintjob it had previously. The patchiness doesn’t show up too badly, and where it’s noticeable it almost looks like a faux-patina finish. People pay money for that look, so we’ll deal. As you can see, our patches blend in pretty nicely. It took some serious grinding of edges with the orbital sander, and some stain-mixing to get the colors right – the newer stuff needed some dark walnut layered into the red mahogany to give it the same tone. We can see where our patches are, but a casual visitor won’t notice them at all. 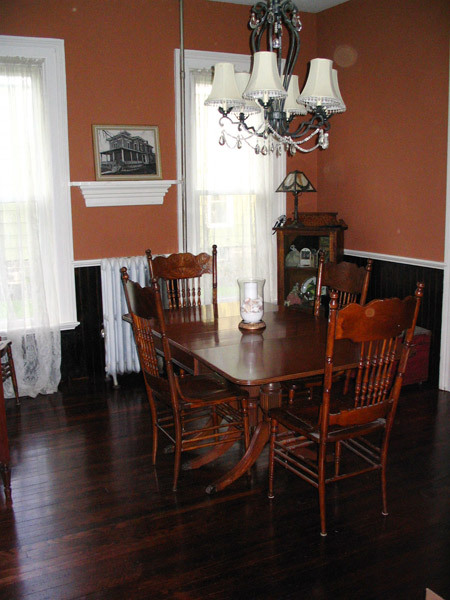 We need to add basemolding to the dining room, which will hopefully make the beadboard/floor transition a little less funky…. we plan to do it in white to match the rest of the house. For comparison, here’s some pics of our dining room last Febuary. I’m definitely digging the terra cotta over the mauves…. interestingly, I had bookmarked a similar color scheme WAY back in October of ’04, before we ever moved in! 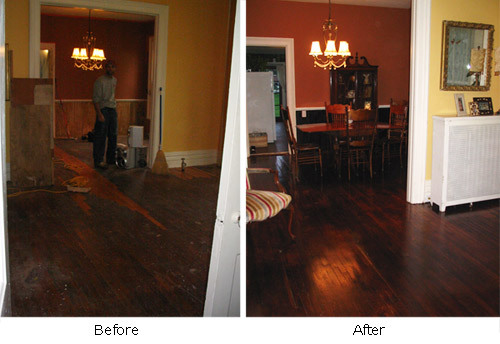 If you’re a DIY’er considering refinishing your own floors, I say go for it. It was a physically tiring process, but not overly complex or technical – especially if you don’t have to patch in repairs. We saved alot of money and got good results despite having seriously demolished floors! Looks awesome you guys! I love the orange in the dining room…that color scheme looked so awesome at Yates St. 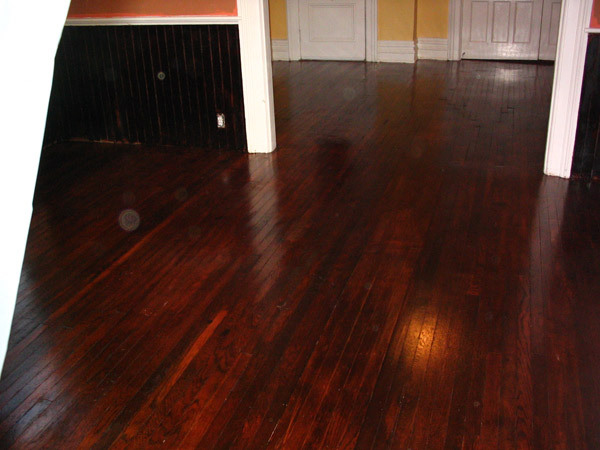 The floor and beadboard, in my opinion, are breathtaking. That dark brown looks so warm and rich. Doesn’t matter if it isn’t perfect — that’s what we all love about old houses. Excellent job. Eilis – there are some beautiful homes down there that need love, that’s for sure! Marie – Glad that you like the look, it’s definitely grown on us and we love the paint color. I guess after all that work we were hoping for something closer to “perfect”, but in the end it keeps with the character of the house so we are embracing it! I adore the dining room color!